I've been increasingly quiet on this blog over the back end of last month, I must admit I've been finding it hard to be bothered to post, other interests have been taking precedent. Anyway, as I feel compelled, here is a quick last blog of of the summer. 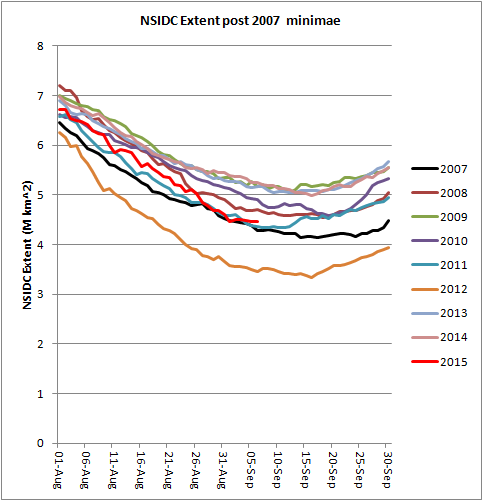 2015 daily minimum extent looks likely to be the second or third lowest on record, not bad after two years when we have been assured by some that the Arctic sea ice is recovering. And zooming in to the minimum, it is clear why 2015 may be the third lowest daily extent. 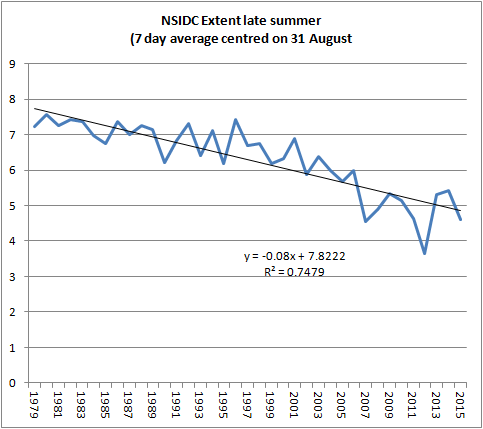 If the current levelling persists it will be third place, but a further drop may still happen. And what of PIOMAS volume? 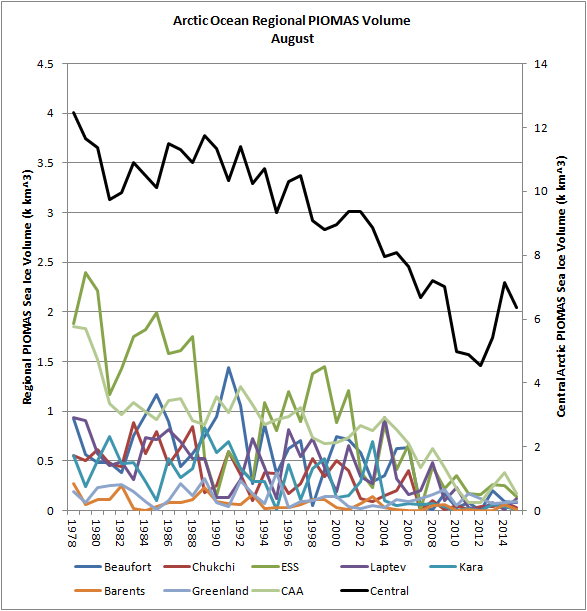 The volume increase of the last few years persists, is still restricted to the Central Arctic. June was average melt weather but July saw a very strong Arctic Dipole and strong losses off Siberia, overall this compounded low compactness leading to strong losses through August. This is seen in the August extent losses. Using anomalies with a baseline of 1981 to 2010 during the period of the Arctic Dipole above average losses were seen in the East Siberian Sea and Laptev Sea (red). Once this lead had been established it persisted through the summer. 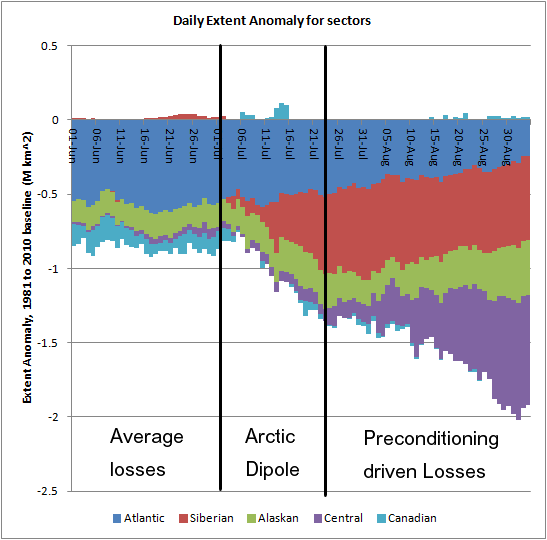 But this set up conditions for above average losses to start in the Central Arctic and Canadian Arctic Archipelago (where the Arctic Dipole was less of a factor). 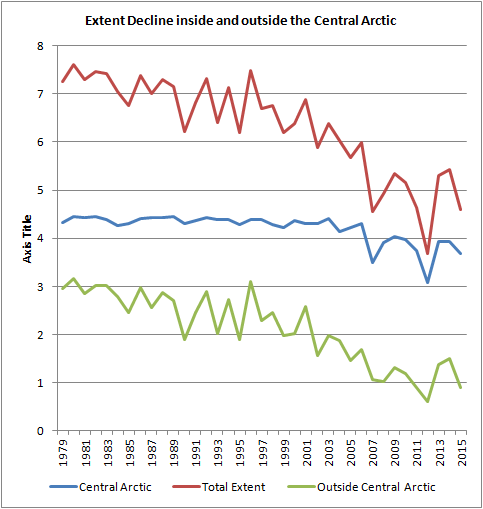 The pattern of losses from outside the Central Arctic opening that region up for encroachment of the ice edge is a relatively recent development since 2007. 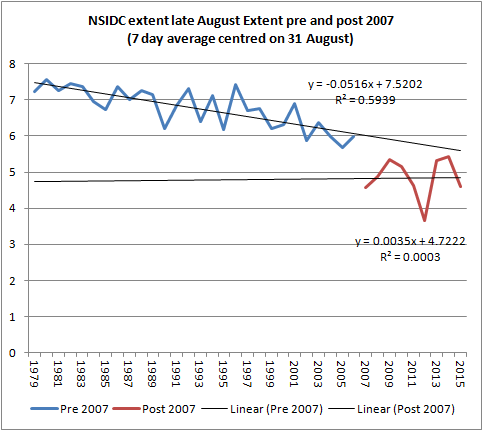 Looking at a seven day average of extent centred on 31 August the Central Arctic (blue) remains resilient to extent losses outside that region, until 2007. There is a clear downward trend. However what happens after 2007? Now in 2015 we have 9 years of data, which is heading towards a dataset worth saying something about, and allows us to make some tentative suggestions about the emerging nature of the post 2007 environment. As of 2012 one would reasonably have concluded that the new regime was one of a rapid loss. 2013 and 2014 may be considered to confuse the issue however they are aspects of weather impacting the ice in the post 2007 period. The trend so far may be flat, but there is the emerging picture of greater volatility. Note that by leaving out the 2013/2014 data points the trend is similar to the pre 2007 period due to the overwhelming effect of the minimum of 2012. We need a lot more years to see whether there will be an inflection from the previous loss rate to a new more level loss rate. However the increasing volatility is to be expected from thinner ice yielding increasing response to weather due to increasing open water formation efficiency. It is possible I will be moved to post on the SIPN prediction in early October. It is also possible I will post on things that occur to me through the autumn. However as things stand I do not intend to post again until April 2016. At the rate I am going I have some 100 hours of such measurements (just evenings and weekends) before I have the dataset I need to the accuracy I need. Chris - can't you automate the measurements? 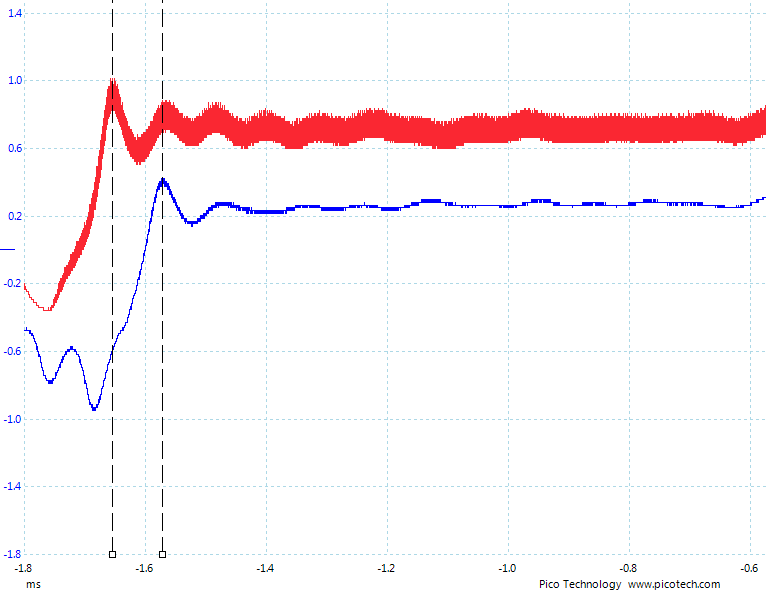 I've taken hundreds of manual calibrations and automated them. I've taken 5 or 6-hour manual calibrations and turned them into two-hour cals that only require occasional operator intervention. For long-term trend studies and measurements of that nature I just hook the equipment up, run a small program, walk away and come back days/weeks/months later to collect the data. With newer equipment it's usually much easier because most have built in file systems so that data can be stored right in the instrument - no need to constantly write to a floppy disk or computer hard-drive. I hate pushing buttons or turning knobs - so anything that can be automated I automate. Well with a lot of the stuff with edges like that (nice and clean) I can, but with the more marginal stuff (some 50%) I've been learning a lot of judgement with known lags. Anyway, I find it a very relaxing new pastime. So I'm doing it the hard way. I could take the bus to some places my walks take me, but the walk is far more enjoyable. I am now pondering doing the resultant calculations manually as I go rather than getting the data then automating them. That way the picture emerges bit by bit, like doing a jigsaw puzzle. Chris - did you catch this by Jim Swift? ""At 7:47 am ship’s time Saturday, September 5th, USCGC Healy became the first US ship to reach the North Pole unaccompanied by another icebreaker. I am not certain of this, but Healy may also be the first ship of any nation to reach the pole from Bering Strait unaccompanied. It was also a milestone of sorts for me, because there have been three scientific crossings by surface ship from Bering Strait to the Pole – 1994, 2005, and 2015 – and I was on all three, doing similar work each cruise (and thus learning about ocean change in this remote part of the World Ocean). My informal observations of the Arctic Ocean sea ice we have been traversing continue in the same vein as during the past two weeks: much of the ice appears to be first-year ice and passage through it has mostly not been difficult. " Comments like this by field researchers (such as Barber and Wadhams) are at least part of the reason why models have to be looked at with some skepticism. Is PIOMAS capturing this? Is the drift age model? It's difficult to believe that the CAB is the last refuge of thicker, older ice when people in situ say ... ummmmm, not so much. The approach from Bering Strait reminds me of a Chinese ice breaker that got a long way towards the pole from Beaufort, there's a paper on it but I can't find it right now. The blog page for the Healey does mention encountering ice from pressure ridges, who is to say how much of this is the remnant of the winter MYI export? Anyway. Models like PIOMAS take in sea ice concentration, so are trimmed by observation of concentration. PIOMAS doesn't explicitly model MYI so isn't really affected by the differences between MYI and FYI. If you, and the others saying the same thing, are correct in saying the ice is in a worse state than satellite data and models suggest this should mean large drops in summer extent within a few years. Yes? In that case the simple answer is to wait. But as of this year the September extent is on track to be at the lower bound of my prediction method using April PIOMAS volume. In other words the hypothesised dependence of Sept extent on PIOMAS April volume hasn't failed to such a degree that it seems reasonable to reject it, and the statistics of that hypothesis are based on 1979 to 2014 data. That fits a pattern of other statistics which make me view 2015 as another year of post 2007 behaviour. PS Sorry, no, I didn't catch that as I'm having a break from sea ice. PPS Draw a line from Bering to the pole and one would expect mostly first year ice (I think - from ASCAT and the Drift Age Model). Chris, I haven't tried to place the Healy's path on a thickness map, but DMI at least show plenty of 2m to 4m ice between the Bering Strait and the pole as of 9-11-2015. I don't have enough data to be able to comment on DMI. PIOMAS August average grid box effective thickness is 1.5m maximum on a track from Bering to the pole. Of course the sub grid thickness distribution will have thicker ice, but that would be equivalent to the ridged ice described in the Healey blog. That said, I didn't get round to running the sub grid code and don't really want to get into coding to give the distribution on the Bering-Pole track. I don't think it's really anything new myself. At a glance it doesn't seem new, but I have saved a copy and will probably get round to reading it over the next few weeks. They took measurements as late as 2013, so I would agree. Also, I have read the study and the language in which it's written suggests more of a steady release and not so much a bomb scenario. At least that's my thought. 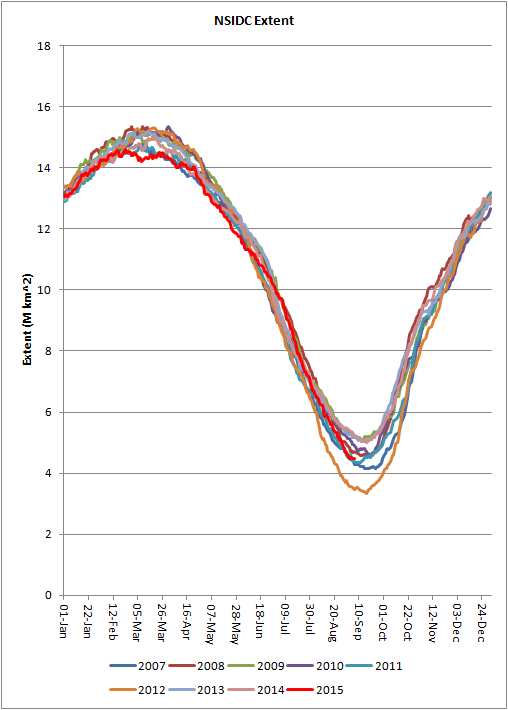 Regarding the questioning by some of the PIOMAS and other related satellite data, I don't the state of the Arctic ice is much worse than what that data suggests. Chris, have fun with testing your new equipment, and thanks for yet another series of interesting posts and analysis. You probably will Neven, and in the meantime I will try to keep up to date with reading your blog. Thanks for your work on that are superfluous.